Cleaning your coffee machine is absolutely vital. I’m coming back again to the subject of cleaning your coffee machine. It’s a topic I keep coming back to, time after time, for the simple reason that we can see the results of bad cleaning almost daily and we know just how badly it can affect the taste of your coffee. No doubt, some of you are thinking “Here he goes again, banging on about cleaning the machine…” Well, I’m afraid I make no apologies about it, it’s such an important subject and it’s even more important if you really care about the coffee you serve. It’s somewhat ironic that the volatile oils in the coffee that give it its exquisite flavour and aroma, are the very compounds that do most of the damage. When they are fresh and newly extracted from the coffee, these oils are fluid and aromatic. The heat from the machine is absolutely necessary to extract the oils from the grounds, and the heat adds to the volatility and releases the aroma and the flavour. Too much heat, of course, can “scald” the coffee and damage these delicate oils but that’s another story. The hot water also helps dissolve the coffee solids, which deliver the mouthfeel and much of the flavour in the cup. The effect of heat over time, however, dries out the volatile oils and leaves a bitter, sticky, burnt coating on the group diffuser and on the porta filter. 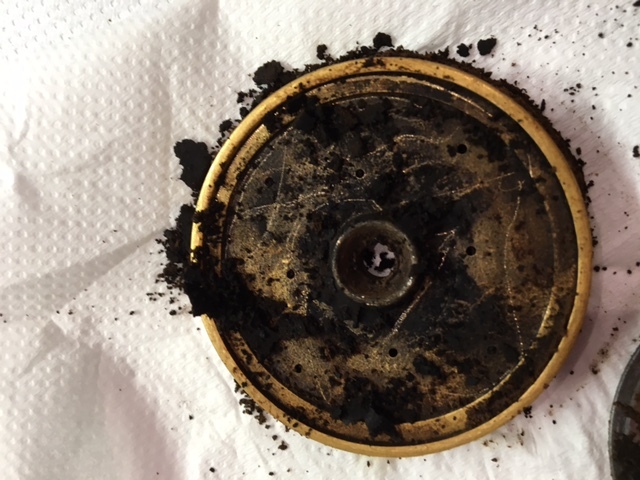 Look at this photo of a group diffuser (which sits behind the shower sieve) taken during a cleaning service on a customer’s espresso machine. You can clearly see the old, sour, stale, burnt-on coffee that will have caused so much bitterness and burntness in every cup of coffee that passed over it. Incidentally, the customer in question is a highly skilled barista who was horrified when he saw (and smelled) what was inside his machine. Please don’t let this happen to your machine. Don’t ruin your coffee. We can’t say it often enough and with enough emphasis, it is vitally important to clean your machine thoroughly every night. So please, please, please, don’t EVER leave it until morning, no matter how late it is, no matter how tired you are. This coating of sour, burnt-on gunk will impair the taste of every extraction that passes through it and if it is left uncleaned overnight, it will harden so much that regular cleaning won’t shift it and it will continue to build up, compounding the problem hour after hour, day after day. You simply cannot make good coffee on a dirty machine. It is absolutely VITAL that your machine is thoroughly cleaned every night, last thing before you close. Even if your favourite little old lady comes in for one last coffee five minutes before closing, you will need to repeat the full cleaning process. One extraction, left uncleaned overnight is enough to ruin every cup of coffee the following day. I can’t emphasise this enough. At least 90% of the times we are called to attend to a machine that “isn’t working right”, the problem comes down to a machine that hasn’t been cleaned properly. We see this problem in places with highly skilled baristas, where the coffee is taken seriously and everything else is done right except for cleaning the machine. This should be the starting point in the process. If you make another coffee after you have cleaned your machine, you have to clean the machine again, even if it was only one coffee, even if you will be open again in “a few hours”. Those few hours are enough to spoil every single cup of coffee you serve from that point until the machine gets a full deep clean. Once the volatile oils are left to dry and harden, routine cleaning is not enough to shift it. We made a short video on how to clean a machine properly. It’s worth showing to your staff. If you follow this cleaning procedure and never leave a machine uncleaned overnight, you’ll never have a problem and your coffee will always be great.